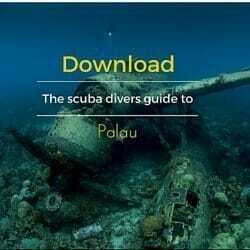 Palaudiveadventures » When is The Best Time to Dive Palau? One question we get all the time is; “When is the best time to dive Palau?” Palau as you all know is in the tropics. Meaning, we get a lot of rain! The good news is that we get 70% of our rain at night. Bottom line is there is no real Palau diving season. Diving in Palau is good year round although many people will avoid June, July and August. Palau has in general two (diving) seasons a “rainy” season and a “dry” season. The rainy season is June, July and August. During these months the trade winds shift, bringing more rain than normal. Of course even during these months we still get some very nice weather. On the flip side, we can still get a lot of rain during the “dry” season. So, what to do you ask? Palau’s average highest temperature is 30°C, with the average low 24°C; humidity averages 80%. The annual rainfall is 373cm (there are numerous heavy thunderstorms in June), with June to August the wettest months; February and March are the driest, although rain can seemingly strike at any time. Although Palau lies outside the main typhoon tracks, it does occasionally get hit. We recommend bringing a good quality rain jacket on every trip to Palau. If you have the luxury of travelling anytime you like, then we say the best Palau diving season is from September to May, and hopefully it will be a bit drier.